It's hard to believe that since we opened our Vimeo account in January, 28 videos have been added by myself and our Video & Filmmakers Club! Collectively, they have been viewed more than 900 times! Thank you so much for sharing in these moments with me. I hope that you will continue to spread our stories through your networks of friends, family, and coworkers. Today, I present three more videos - one from the Year-End Dinner and two from our 31st biannual Tutor/Mentor Leadership & Networking Conference. Above you will see parent speakers Ms. Caprice Mitchell and Ms. LaJoyce Brown reflect on what Cabrini Connections has meant to their families. Below you will see Loyola University Chicago Professor James Garbarino Ph.D. speak about youth violence and Scott McFarland speak about the Serve Illinois Commission on Volunteerism and Community Service. 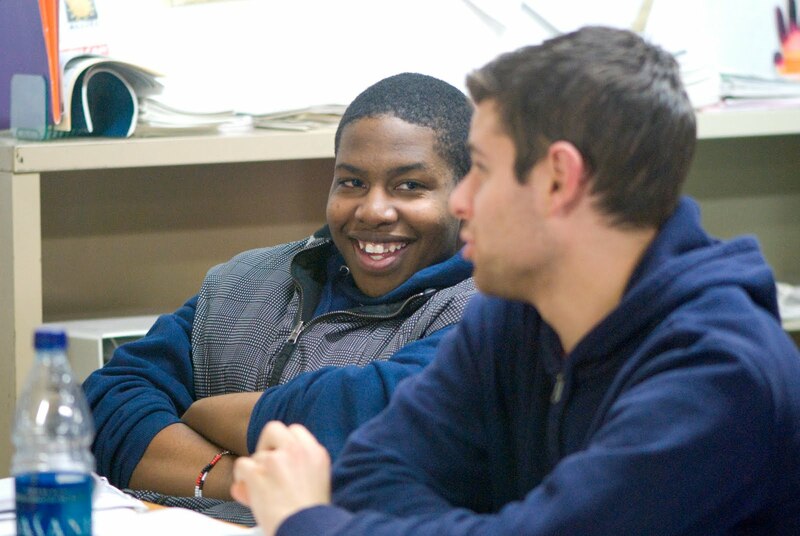 Though regular tutoring session have ended for 2009-2010, summer is in full gear here at Cabrini Connections. You can read more about our summer schedule here, and, as always, check my blog for previews and recaps of everything! Thanks for visiting! Words can hardly describe what an uplifting and inspiring time was had by me at Cabrini Connections annual Year-End Dinner on Thursday, June 10th, at Cornerstone Center. Luckily, I have videos to share with you that convey some of what took place. Thank you to each and every person who supported the dinner either by attended or promoting or donating or just reading this post. We are all about connections and one is being made right now. I hope you enjoy these videos (especially the ones created by students) and share them with people in your network. The more eyes we can get on our work, the more support we can find to continue doing it. Thank you for your help! First up is a four-minute video and picture montage which recaps the entire night. It was produced by one of our interns from Illinois Institute of Technology, Minsang Lee. Second is a video of alumni speaker Tangela Marlowe who participated in Cabrini Connections from 1993 to 1997. It was shot by Reggie Murphy and Shaquille Strauther and edited by me. Last is all four of the Video & Filmmakers Club's short films. Two are fiction, two are documentary, and all were produced entirely by students in grades 7-11. These are a must watch! Click on the club's picture to be taken to their video showcase. Our annual Year-End Dinner is tomorrow! I am very excited to see over 200 students, parents, volunteers, staff, board members, donors, and others come together in celebration of yet another fantastic year of tutoring and mentoring at Cabrini Connections. It is hard to put into words how much this year has meant to me, but I guess I've been doing that all along here on my blog. Thank you so much for reading! Whether this is your first time or you're subscribed via e-mail (special shout-out to you guys! ), I really appreciate your attention. Through me, you are giving our students attention and that is a tremendous blessing. In describing the impact of our program, I often try to have people imagine a 12-year-old in 7th grade, who may live in poverty or have other hardships, being instantly connected to almost 100 caring adults (our volunteers) as soon as he or she walks in our doors. Above and below, you can watch short video recaps of two workshops. The first is "Non-Profits: Time to Get Mobile" presented by Brian Banks of AdvaTEXT, and the second is "How to Help Your Students Finance College" presented by Maria Bucio of the Illinois Student Assistance Commission (ISAC). Twice a year we receive great feedback from attendees who value this leadership & network opportunity. If you, too, see value in this service, please consider making a donation to support the Tutor/Mentor Connection. And if you're around in November, we would love to see you at our next conference. It's bound to be even better! Thank you! We have nine seniors graduating from Cabrini Connections this year; some who have been with us for the maximum six years like De'Sean, Gregory, and Vontesha, and some who have been with us for just one year like Brittany, Diamond, and Megan. On Thursday, June 10th, we will join them in celebration at our Year-End Dinner as they are each presented with graduation dollars for their hard work and dedication to the program. For this our last week of tutoring for the 2009-10 season, we would like to put all of our seniors in the spotlight! We wish you the best of luck in college and we hope to see you again soon as we continually say, "Once in Cabrini Connections, Always in Cabrini Connections."